Do Batmans dream in color? Although Batman only builds in black (and sometimes very, very dark grey), I’m sure he’d appreciate this wonderful rainbow creation by Alanboar Cheung which depicts a small child dressed as Batman, dreaming of being the Dark Knight. 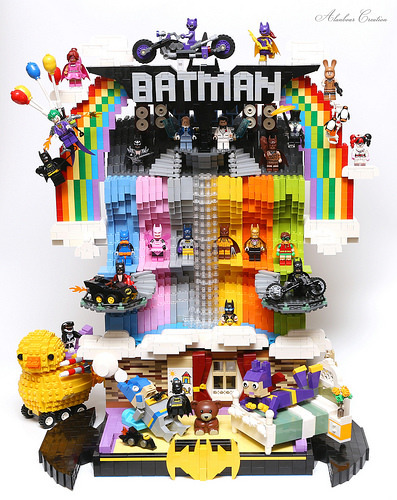 The build has great details, including a redesigned Duckmobile, adorable brick-built characters, and rainbows and clouds reminiscent of Cloud Cuckoo Land. In addition to many of the villains and sidekicks from the LEGO Batman Movie, Alanboar also included every wacky version of Batman from the new sets and from the Collectible Minifigure series. Can you spot them all? I know of three LBM Batsuits that aren’t represented in this MOC. One is currently available in the US, but the other two won’t be for a couple more days.